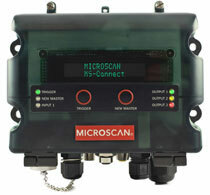 The Microscan MS-Connect 210 can connect to a host using serial or Ethernet connection. Ethernet TCP/IP and EtherNet/IP protocols are available out of the box. The MS-Connect 210 also provides two lines of decoded information, the optional display is very bright and easy to read. The practical design has four access holes located on the box which allows users quick, easy, and clean wiring of inputs and outputs. Mounting is simplified with four accessible through holes for mounting screws and an optional plate is available for easy DIN rail mounting. These features along with others, make the MS-Connect 210 the ideal industrial connectivity option. The Microscan FIS-0210-0003G is also known as Microscan Systems	FIS-0210-0003G	or FIS02100003G	.